My app needed a simple Android notification with sound and icon. So here’s the code I used to make that happen. I know that there are many other types of notification in Android, but this time, I just want to show you a very simple code that can be a solution to your problem too! When you run this code. (make sure you’re not in silent mode). When you slide down the notification bar. 1. First, you can click the “Cancel Notification” button. 2. Or, second, swipe the notification to left or right (swipe the notification in the third image). These ways were set programatically, so read the code (with comments) below. // this is it, we'll build the notification! I also put the ninja icon in our drawable folder, that’s the source of our icon. Please share what Android notification example you want next! Reference: Android Notification with Sound and Icon Tutorial from our JCG partner Mike Dalisay at the The Code of a Ninja blog. 20 Comments Views Tweet it! Hi,Thanks for sharing this tutorial.I would like to know how to show notification on an app after 2 days since its use? Use AlarmManager by using instance of calender. I am creating this Notification in a Fragment and is showing an error while calling constructor of intent. I cannot access your source code link. We have fixed the download link, sorry for the inconvenience. I just want to ask what is the purpose of the menu.xml? Great tutorial. I downloaded the source code and it worked nice. At the moment I copied the NotificationReceiver.class in my project but pintent doesn’t work. The second activity doesn’t start. Do you got an idea what could be the reason? 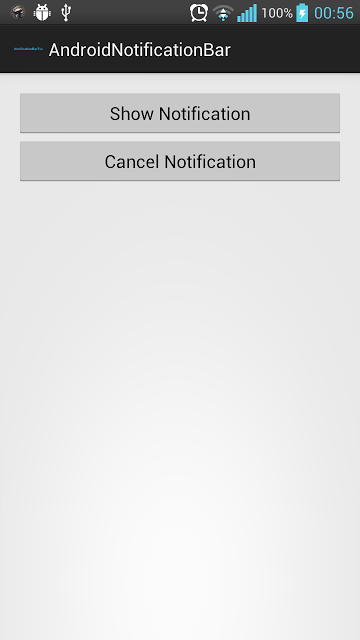 hi i want notification like whats app in my android app for sending request like leave and approve from other side how can i do this please help i need it badly. hye.. how to create notification bar to notify the others devices connect to our wifi hotspot? Hi. i want the notification should be on app icon. fine if it is coming in bar, but i want on app icon as well. can you please help me out? Any advice on how i can receive push notification even when the application is “not running”? hello.code is running perfectly without any error but icon on notification is not displaying.it is set to automatically android icon.i m changing it with setsmallicon(r.drawable.myicon).still it is not changing icon. Thanks for the codes. It worked fine for me.